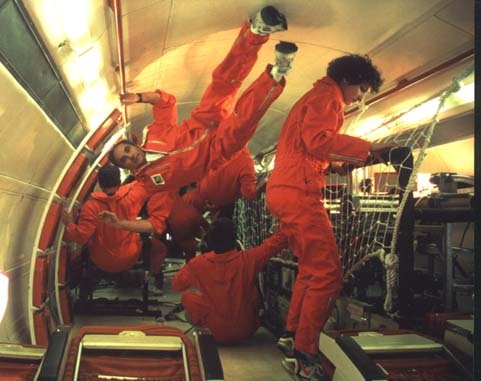 Manned flights require for astronauts confinement, the respiration of synthetic atmospheres, and for Extra Vehicular Activities decompressions procedures. All these environmental circumstances are among JCLP HYPERBARIE's know how. JCLP HYPERBARIE has been awarded several contracts from ESA to draft and finalize the Atmosphere Quality Standard for Manned Space Vehicles. This standard now is published under reference : ESA : PSS 03-401. In 2002/03 a new contract with ESA-ESTEC concerning ECLSS standardization for long duration flights (march) has been awarded. Mr. Le Péchon has been on 6 parabolic 0-G flights, as experimental subject for respiration physiology research. This is a total of 191 parabolas 0-G et 1 parabola with Lunar gravity. Air France has contracted JCLP HYPERBARIE to organize safety aspects and training for the personnel visiting Boeing 747 kerosene tanks for leak tests in depression. Airbus-France, since 2002, has contracted JCLP HYPERBARIE for the training of personnel exposed to pressure for the cabin pressure tests on plane delivery. ESA has awarded a joint contrat to CERTSM -French Navy- and JCLP HYPERBARIE to carry out an evaluation of human production of atmospheric pollutants during the confinement experiment EXEMSI in Kholn by DLR (1992). In 2016 Jean-Claude Le Péchon has been the speaker for several conferences : "Space and Diving; Common problems, share solutions"